Vedic Mathematics is being taught successfully in schools across the world including the United Kingdom, Ireland, USA, South Africa and in many other countries. The experts in those countries have established beyond doubt that Vedic Mathematics is far simpler and coherent as a learning system than the conventional methods. Westerners have been astounded by the elegant, easy & integrated approach and have acknowledged and acclaimed the superiority of Vedic Mathematics over modern calculators; the Vedic Mathematics course in those countries is called the ‘Cosmic Computer’ because Vedic Mathematics they say is “modern and user-friendly”. Further research is steadily picking-up in Sweden, Germany, Italy, Poland etc. A Centre for Vedic Mathematics was established in Singapore in November 1999 where Kenneth William was invited from U.K. to prepare school curriculum. Regular research is being done on the subject by Kenneth Williams, James Glover, Jeremy Pickles all from the UK and many others. 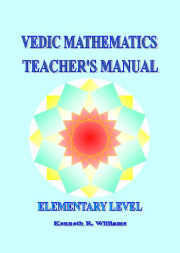 It would be useful if you could kindly look at the amount of material available in the newsletters of the above authorities and others in www.vedicmaths.org, www.vedicmaths.com, www.vmacademy.com etc. Mr W. Bradstreet Stewart from Sacred Science Institute, USA has conducted considerable research in recent years which may be accessed on www.sacredscience.com. Our Foundation / Academy’s Research Director, Dr S N Bhavsar from Pune is endeavoring his level best to travel to new heights in higher application of Vedic Mathematics. The text-books and course outline has been jointly prepared by eminent British teachers who have introduced the subject in the school curriculum. Because Vedic Mathematics has successfully proved the efficacy of the system in foreign countries and is becoming increasingly popular in its home land, the National Curriculum for School Education (pg. 57) says “the students may be encouraged to enhance their computational skills by the use of Vedic Mathematics”. It is my sincere advice that foreign scholars like Kenneth Williams and James Glover be invited to conduct workshops / seminars / conferences under the Auspices of NCERT, so that Indian scholars could get an opportunity to inter-act with them, hold open house discussion in order to structure the course content for incorporating Vedic Mathematics in the existing course-books from class III to XII. Potential writers of Mathematics text-books may also be invited for such events as participants, so that this amazing discipline can be given a proper place in the country. Let us not reject or disregard the discipline because it carries the adjectival appellation, ‘Vedic’. We as a specialist organization would be more than willing to help with all our resources of expertise to supplement your efforts. Of late our experts’ panel further observed that unethical centers and instructors are mushrooming in the country where incorrect and spurious knowledge of the discipline is imparted by unfair means. It is therefore, our social as well as moral responsibility to discourage such a practice. I am aware that a controversy has been raised on the question as to whether Vedic Mathematics is to be found as such in one of the Vedas or that it was merely evolved, formulated and expounded by the late Jagadguru Swami Sri Bharti Krsna Tirthaji Maharaja, Sankaracarya of Govardana Matha, Puri. That controversy is merely polemical, and indeed, irrevalant as reflected in my Forward to books published under India’s Scientific Heritage series. The question is whether the sutras in Vedic Mathematics do provide computational aid which by itself distinguishes what we call Vedic Mathematics. The Supreme Court has rejected the objections to Vedic Mathematics by recognising its value as computational aid and by clearly holding that it cannot be excluded merely because it is called ‘Vedic’. All I want is that you may consider forwarding this letter to Schools, Educational Authorities and Institutions, to whom we are prepared to offer all appropriate assistance including text-books and course outline as well as instructors and workshops for students & teacher’s training programme. Please address your correspondence to Mr R P Jain, Vice President, World Academy for Vedic Mathematics, 41-U A, Bungalow Road, Delhi – 110 007, Tel # 2391 1985 / 8335 ; 2393 2747 / 2397 4826, Email or . It would be still better if you communicate with him on his mobile # 98112 10999. He will keep me informed. There will be a Vedic Mathematics seminar at the University of Melbourne on 9th November, 11am. This will be given by Dr Subhash Challa of the Dept. of Electrical & Engineering Electronic and will be in the Greenwood Lecture Theatre, Level 1, Electronic Engineering Building. There will be a talk on Vedic Mathematics at the prestigious Freudenthal Institute in Holland as part of the Dutch National Mathematics Days next 6th, 7th February. Details later. The World Academy for Vedic Mathematics, an integral part of the main foundation in Nagpur, the International Research & Resource Foundation for Indian Heritage isthe central body working for the cause of Vedic Mathematics across the world. The academy recently arranged a series of Introductory Workshops in Kolkata with the support of Motilal Banarsidass Publishers, a premier publishing house in the country. The first workshop was held at “Arihant Gardens” on 31st August. It was attended by around 35 candidates. The participants came not only from Kolkata but also from its adjoining districts, too. The age of the participants ranged between nine years to fifty-five years. Most of them were of course in their mid-twenties and bulk among them being M.B.A aspirants. The response of the crowd was very encouraging. In fact in the middle of the session some candidates stood up and asked the expert that why is the subject, which is having, such wisdom in it is not getting incorporated in the school curriculum. It was definitely a very encouraging experience for the Academy. This was followed by three workshops held at the 26th National Bookfair which was arranged by National Book Trust, India. The workshops were held at the Bookfair auditorium on 8th, 13th and 14th September. Those workshops too got overwhelming response from the people of Kolkata. Everyday the hundred-seater auditorium got filled up to its almost fullest capacity. Like the previous workshop some people attended this workshop from districts too who incidentally came to the city solely for attending the workshop. The age of the participants ranged between ten years to eighty-six years. Some of the prominent educationists, professors, headmasters and teachers of mathematics did attend those workshops. The participants included a retired professor of a premier Engineering college of the globe and a Harvard University Graduate, too. The organizers as well the expert had a tough time to control the crowd after each session. Then again two workshops were conducted at a premier school of the city named M.P. Birla Foundation Higher Secondary School on 22nd September. One hundred and forty students of standard twelfth and abound six teachers did attend those workshops. The response of the crowd was just fabulous here too. It was definitely a laudable move on the part of the school to arrange such a workshop in their school. All the above workshops were conducted by Debmalya Banerjee, the authorized points man of the academy in Kolkata. The workshops did get twelve coverage’s by the print and the Internet medium. An international News Channel too broadcasted the interview of the expert. A leading regional Channel broadcasted the exclusive interview of the Vice president’s of the academy twice. The expert did shoot for eleven episodes on Vedic Mathematics for a channel named “Global Ahimsa Media” which is incidentally going to be the first social channel of India and getting launched on 2nd October. The question that the organizers had to encounter most was - When is the World Academy going to arrange the next series of workshops? The people repetitively enquired about kind of courses available on this subject. of the students wanted an advanced/ intermediate workshop as well which is being planned. These workshops were run by Dr Abhijit Das. Ranchi University organised a seminar of college teachers on Vedic Mathematics, Yoga and Music from 4th to 24th september, 2003. Dr. D.P.Verma, Dr. Devendra Bhatnagar and Dr, Narottam Puri were asked to participate as academic staff for vedic maths for about a week each. The organiser is Dr. K.C.Prasad, Prof. of Mathematics, Department of Mathematics, Ranchi University, Ranchi (Jharkhand State, India). 1. A seminar was conducted at Bharatiya Shiksha Samiti, Lucknow, India during August 21 to 24 in which 32 teachers of vedic mathematics from all over eastern Uttar Pradesh were the participants. The conference was organised by Sri Surendra Kumar Singh, vedic ganit pramukh, East UP, Vidya Bharati. Dr D.P.Verma, All India vedic ganit pramukh and Sri Devendra Rao Deshmukh, All India saha pramukh were academic staff. 2. A seminar was conducted at Hathras near New Delhi, India during August 27 to 30 in which 40 teachers of vedic mathematics all over from western UP and Uttranchal state participated. This was organised by Sri Yogesh Kumar Gupta, vedic ganit pramukh, wertern UP and the academic staff included Dr. D.P.Verma, All India vedic ganit pramukh and Sri Devendra Rao Deshmukh, All India saha pramukh. The approx participants were 40 in the age group 5-55. About half the participants were new and the rest half had some knowledge of vedic maths. They were trained to the extent that about 5 in each seminar can now conduct a seminar of 5 days and they liked the subject so much that the decided to conduct seminars of 1, 2 or 3 days at the district level at their respective places. Dates and venue of 3 seminars in western UP (India) were actually finalised as I reported in my earlier letter. Even the new participants were so happy that they decided to do something for the propagation of VM. Following the success of the first two courses Dr S K Cosmic Kapoor has started two more: Course No. 3, Mathematics of Sanskrit and Course No. 4 Mathematics of human frame are also being launched to compliment and supplement courses 1 and 2 to complete the initial exposure to Vedic systems during one year duration. Registration for courses 3 and 4 to commence since 19.09.2003 while actual day to day courses to commence since 26.09.2003. Till today Course-1 has 203 registrations while Course-2 has 103 registrations. so you can still register and start at the beginning of any course. An article, "Vedische wiskunde", by Marco Swaen, has appeared in the Dutch journal for mathematics teachers: ‘Pythagoras’, Sept 2003. An article has appeared in the Nexus magazine, Oct-Nov 2003: “Vedic Mathematics Rediscovered”, by Jain. The book “Vertically and Crosswise” by A. Nicholas, K. Williams, J Pickles and the books “The Natural Calculator”, “Triples” and “Astronomical Applications of Vedic Mathematics” by K. Williams have been published by Motilal Banarsidass and are now available. SDK Technologies an elearning company in India developed a PC CD - ROM 'SDK's Speed Math Tutor' based on Vedic methods. The sutras given by Sri Bharati Krsna Tirtha Swamiji are presented in a very simple and interesting manner. This is an interactive CD with audio and text explanation at every stage. This tutor is designed such that it creates interest in children to learn vedic methods. Unlimited examples and practice is given for each method. There are two types of explanation - eclassroom and elearning. eclassroom is similar to classroom explanation and contains a fixed example. In elearning user can see as many examples as he want. A friendly character guides through the tutor. 31 - Why Vedic Mathematics?